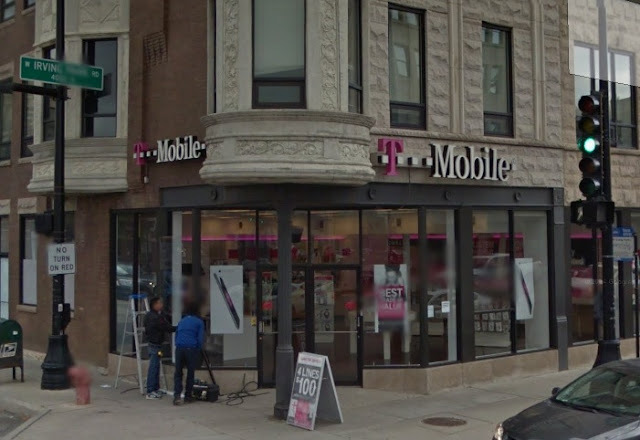 Two men donned construction worker disguises and brandished a semi-automatic handgun to rob a T-Mobile store less than a half-mile from Chicago Mayor Rahm Emanuel's house Sunday morning. At least 30 iPhones and Galaxy-brand phones were taken from the store, which sits on the six-way intersection of Lincoln, Damen, and Irving Park Road. Police said the suspects entered the front door at 11:15AM and immediately made their way to a safe in the back, which may indicate that the robbers have inside knowledge of the store's operations. #1) Wore an orange construction vest over a red hoodie. He had gray pants, a gray skull cap under his helmet, and is believed to have a lot of hair on his head. #2) Wore a yellow construction vest. Had braids or dreadlocks that may have been a wig. The two were last seen running northbound on Damen and then eastbound in the first alley.